I enjoyed this book so much! I could relate to so much of how the author feels about her cats and how they comforted her in her anxiety. It was wonderful to read about someone having the same feelings as I do about my own pets. Her love is for her cats and mine for my dogs but the relationship with our pets feels exactly the same. Lonnie was living in San Francisco, a celebrated poet and author, when she met her husband in her middle age. Her own parents were elderly so they made the decision to move back to Michigan. She finds herself living in an isolated farm house which is a far cry from her vibrant, busy life in San Francisco. Then God brings into her life KitKat then Lucy. She shares how these cats brought so much to her life. She had cats as a child and, while they brought her comfort, they also brought anxiety because her parents believed that cats should be allowed to roam outside. So many times, her cats never returned. 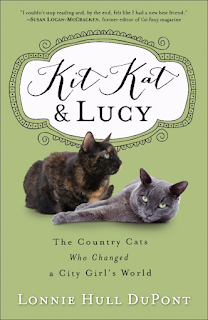 KitKat and Lucy would be indoor cats and bring her comfort, companionship and peace. I absolutely loved how she shared all the antics of her precious cats! They are so in-tuned to her feelings and her husband. I loved seeing how her husband, a man with a cat allergy, loved the cats, too, and bonded with them. I found myself laughing and crying at how much these cats meant to these two people and how my own feelings for my own pets made me relate. Even if you're not a cat lover, you will love this book! It warmed my heart and blessed me so much. I highly recommend this book and give it 5 our of 5 stars.